Cows have always embodied the Feminine Spirit. They provide nourishment not only to their own young, but also humans. This is probably why early humans considered cows to be sacred. Ancient cultures, like the Babylonians, Greek, and the Egyptians, worshiped gods that had bovine characteristics and in the Norse tradition, the four Rivers of Power flowed from Audhumla's udder. In Hinduism and Buddhism, cows are revered as symbols of Piety and Patience. These animals will never scurry around, choosing instead to take their time to do every activity. In many indigenous cultures, cows are status symbols and owning a large herd is equivalent to having the latest Bugatti Veyron parked in your garage. It's not uncommon for these designs to be used interchangeably with the Bull persona, for e.g. 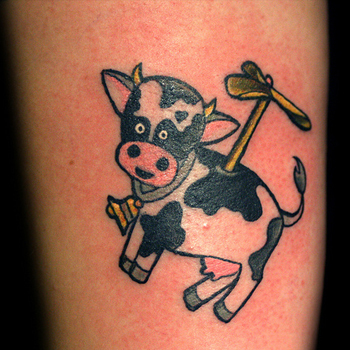 Cow Skull tattoos actually refer to the tattoos of the skull of a bull, which is associated with masculine traits. Hathor is the ancient Egyptian goddess of Motherhood, Fertility, and Joy. In most hieroglyphics, she is depicted as a woman with the head or horns of a cow. In some drawings, there is a golden sun disc between the horns. Hathor tattoo designs tend to be most popular with women who identify with the role of being a nurturer and provider. These tattoos, sometimes known as Redneck Tattoos, are simply expressions of your rebellious and humorous side and have no real spiritual bearing. For most persons, belly button tattoos are an extension of 'Pull my Finger' pranks. When it comes to choosing the right tattoo design, you need to keep two things in mind: what your new tattoo will symbolize and where it'll be placed on your body. Figure out which artistic or cultural elements could be added to spice up your tattoo design. If you need some inspiration, then visit our design page at www.itattoodesigns.com or take advantage of our Custom Design Service, where our team can design a truly unique piece for you.